So many readers have requested this long-out-of-print issue that The Taunton Press has authorized a special limited-edition reprint of this highly sought-after magazine. Now you can enjoy this premier issue of Fine Woodworking exactly as charter subscribers experienced it in 1975. This authentic reprint includes all the same articles, ads, materials, and information as the original, providing an extraordinary look back in time and the opportunity to own a copy of this coveted issue. Why is this first issue so important? When it launched, Fine Woodworking made history as the first and only magazine entirely and exclusively dedicated to woodworking. At long last, the woodworking community had an authoritative voice, a forum for sharing ideas, and a trusted resource for information. This exact replica of the magazine invites you to browse its big over-sized pages, enjoy the striking black-and-white photography, and see what projects were popular four decades ago. Plus, it comes in a specially designed protective folio - a handsome addition to any workshop, den, or library. Treat yourself or give a gift. 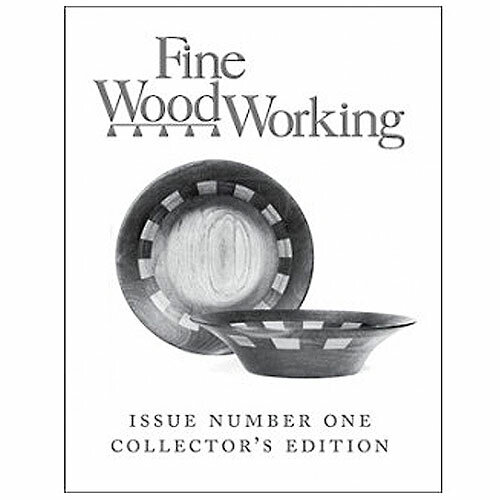 This distinctive collector's edition is a special treat for Fine Woodworking readers and a welcome gift for anyone who loves this timeless craft. Only a limited number are available.